I haven’t updated in a while. But you know how it is when you’re rewatching The Wire. Am I right, dawgs? 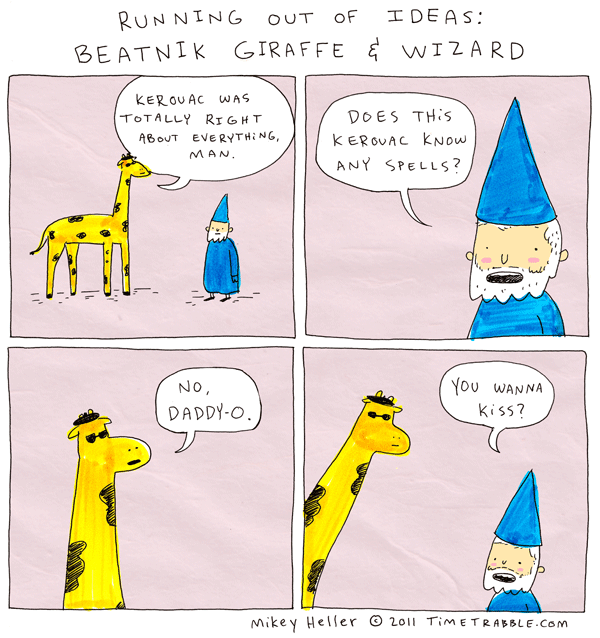 This comic is an important example of work produced by a creatively depleted mind. Where can I recharge my muse-juices? You ain’t got no honey nut? this cartoon was pretty unrealistic. Also possibly old episodes of Spongebob. Recharging the Muse Juice is a tough one. When I sit and try to think of a new comic idea all I see are tumble-weeds. The flash of inspiration comes when I’m not trying to think about a new comic. Good luck and Cheers! Do a comic with dinosaurs. You do well on those. Whenever I get stuck on working on a comic man, I usually listen to a mixed variety of tunes. Crank that tunage and browse through some old photos or something else memorable, and ideals usually flow for me man. Either that, or go out for a bike ride, sit in a store/coffee house and just people watch. Lots of stuff come from the mundane and overlooked. Hope that helps bronanski, peace.